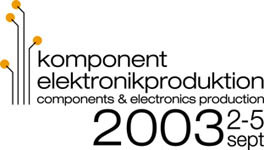 SiTek welcomes you to the Components & Electronics production exhibition 2003, September 2 - 5 at the Swedish Exhibition & Congress Centre in Gothenburg, Sweden. Take the opportunity to meet us and we will tell you more about our, position sensing detectors (PSDs) and how you can use their unique qualities. We are at you service with all available knowledge during these days so take the chance to lern more about our wide range of standard PSDs and the special features our customised PSDs have such as stray light elimination, wavelength and sensitivity optimising. Let us present our latest development the SPC-PSD that is a PSD with an attached signal processing circuit. You are welcome to our booth B04:42 to learn more about non-contact measurement applications.